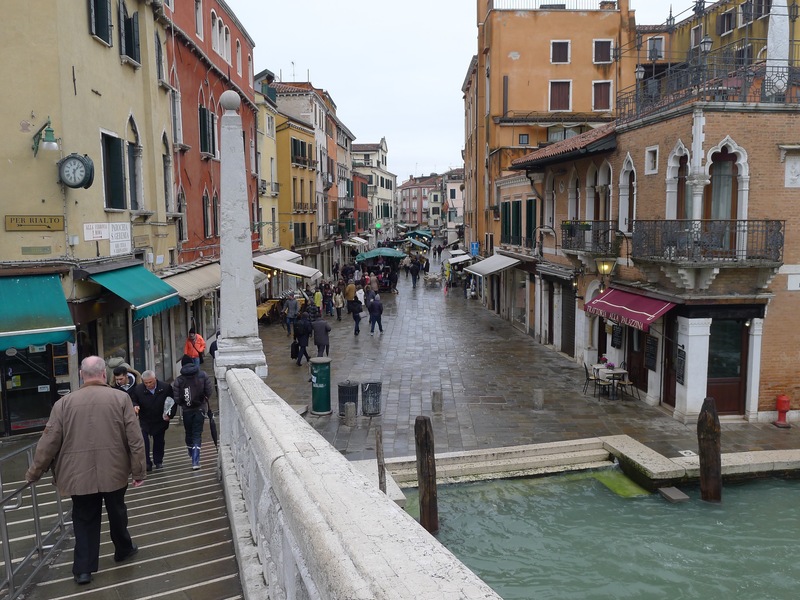 The last time I had been to Venice was 51 years ago, when I was on a European tour with a group of college students, and all I remember from that trip was being encircled by pigeons in St. Mark’s Square. I really didn’t even remember the famous square very well. This time it was a lot different. 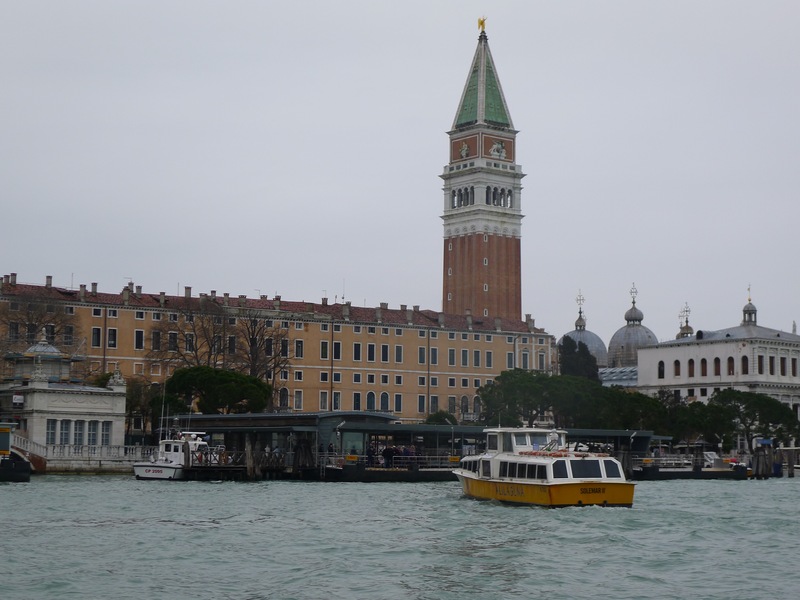 Venice was the first stop on a recent 10-day cruise that took us down the east coast of the Adriatic, starting in Venice and ending in Athens. 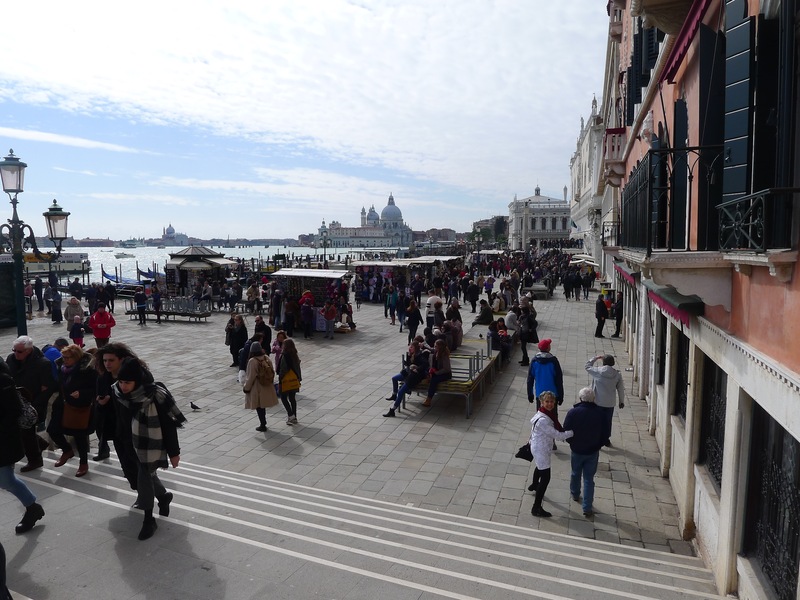 Very wisely, we tacked on an extra, non-cruising day in Venice and an additional day in Athens. 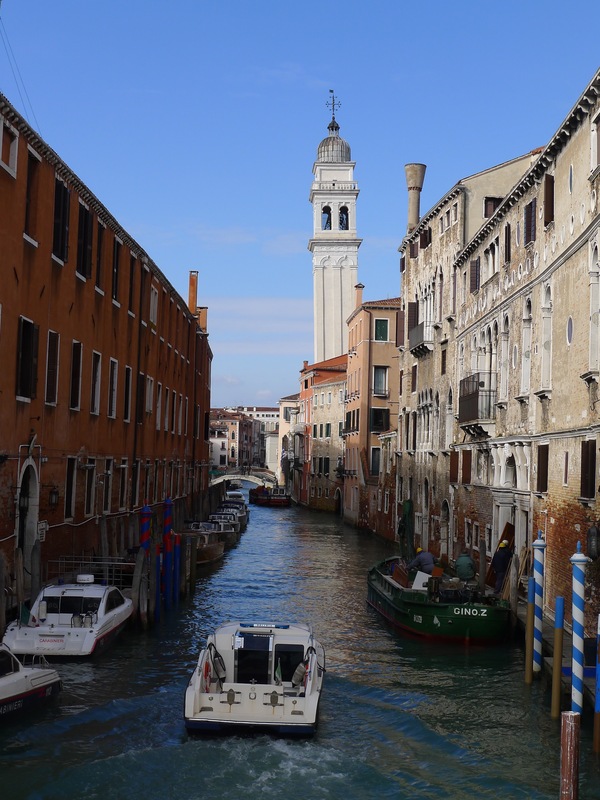 I’m going to be bringing you at least two more sets of photos, but today’s post is dedicated solely to Venice, which tour-book author Rick Steves calls “a fantasy world” unlike anything first-time visitors have ever seen. 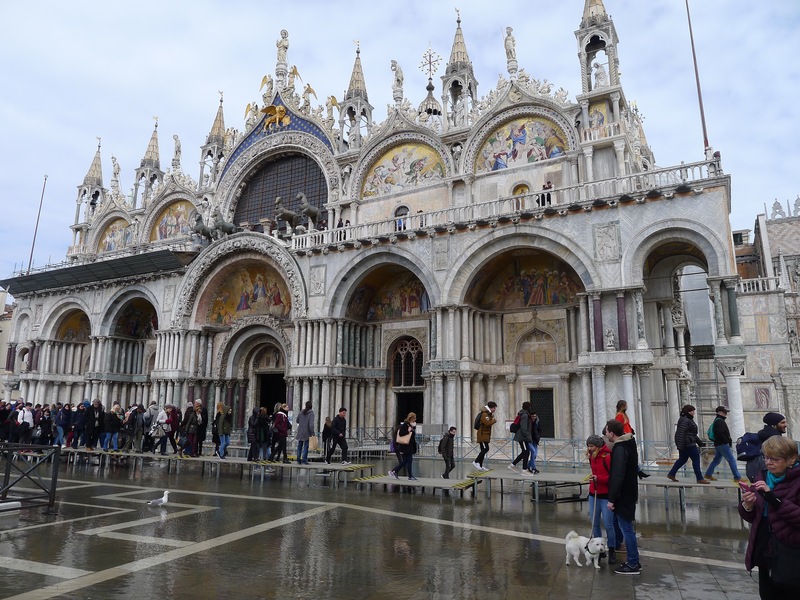 St. Mark’s Basilica is the most prominent landmark on the square. 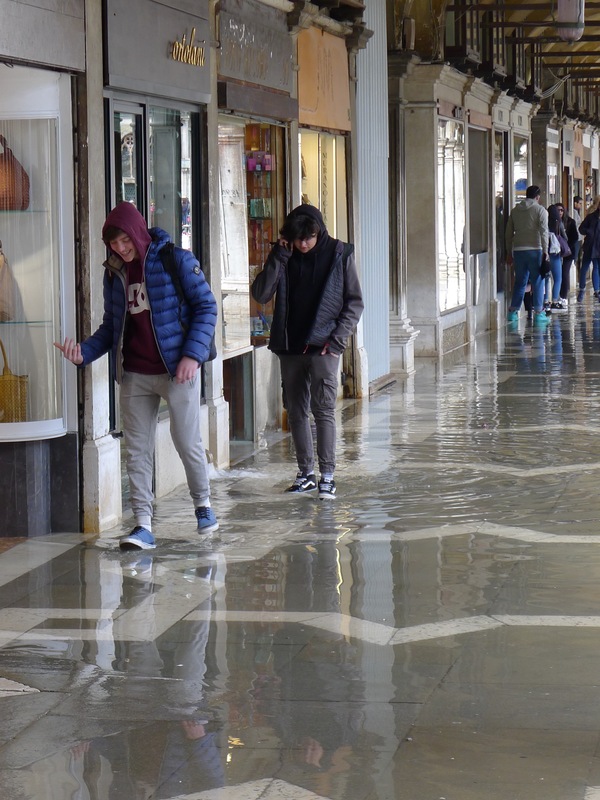 When it rains in Venice, the water rises into the square — as well as in the city’s narrow streets — and portable platforms are set up to help people keep their feet dry. To some people, mostly the young, the water doesn’t pose much of problem. 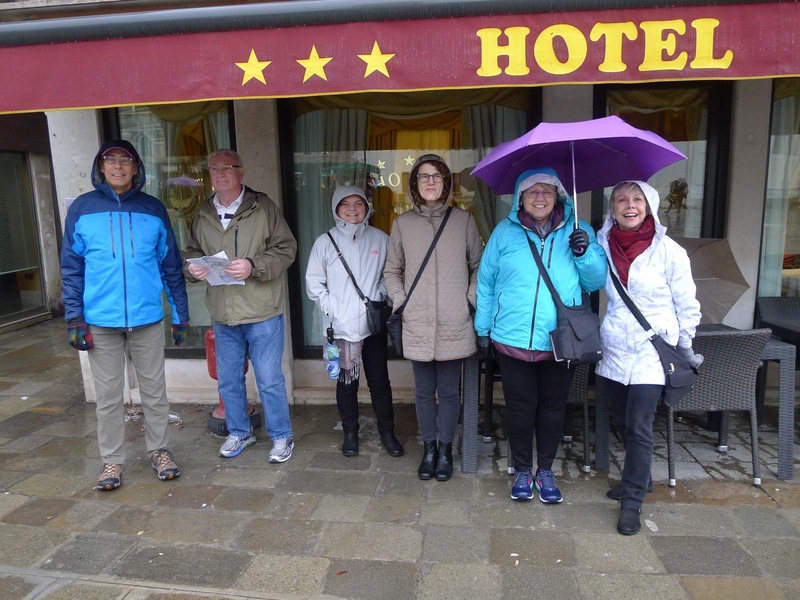 Here’s some of our group, including Patty (tan coat), huddled under an awning. 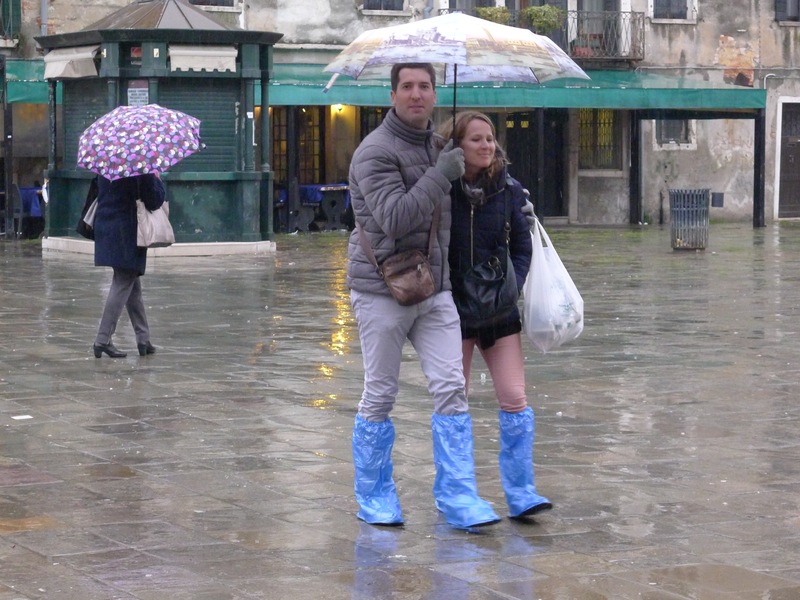 Plastic pullovers — of feet — are a popular product, even at an outrageous 10 Euro (about $12) a pair. 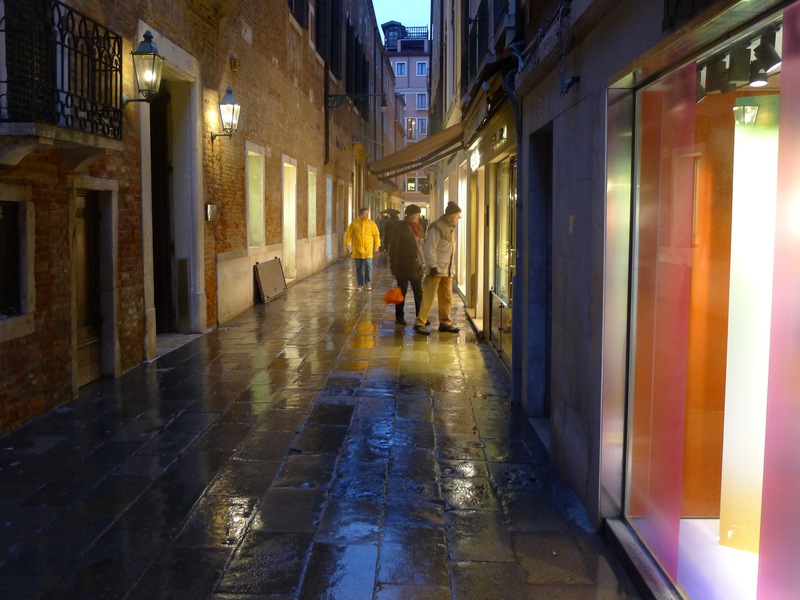 The cold, rainy weather kept the gondola business down, but they sure are a beautiful sight. 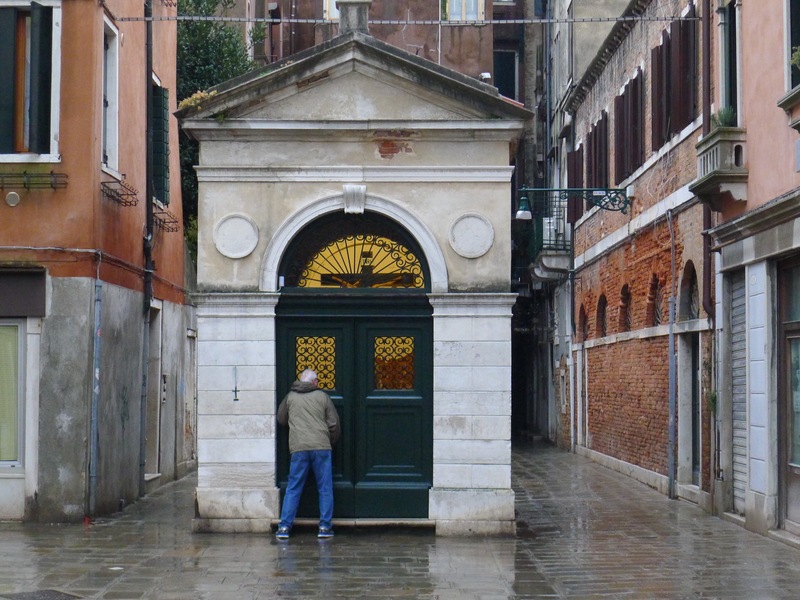 Ron Darst, a member of our group, took a close look at what, I guess, is a tiny chapel. 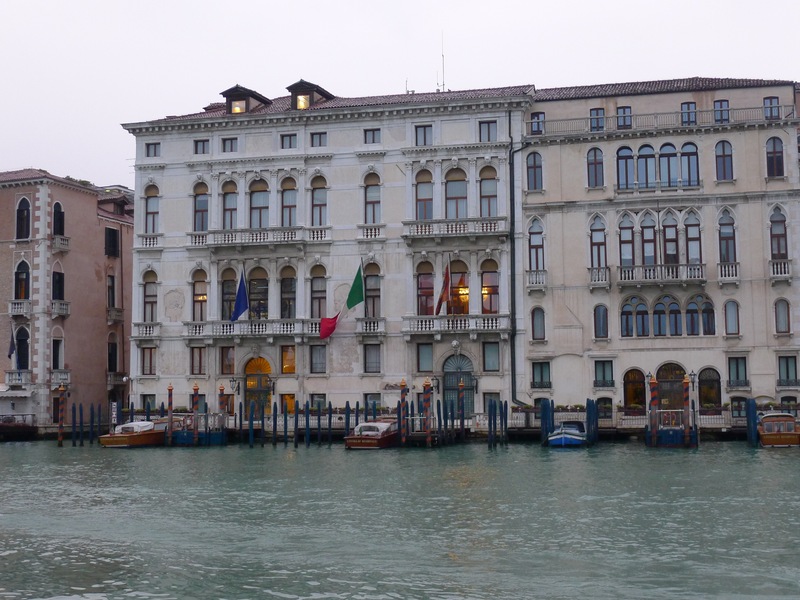 Many fine homes line the Grand Canal. 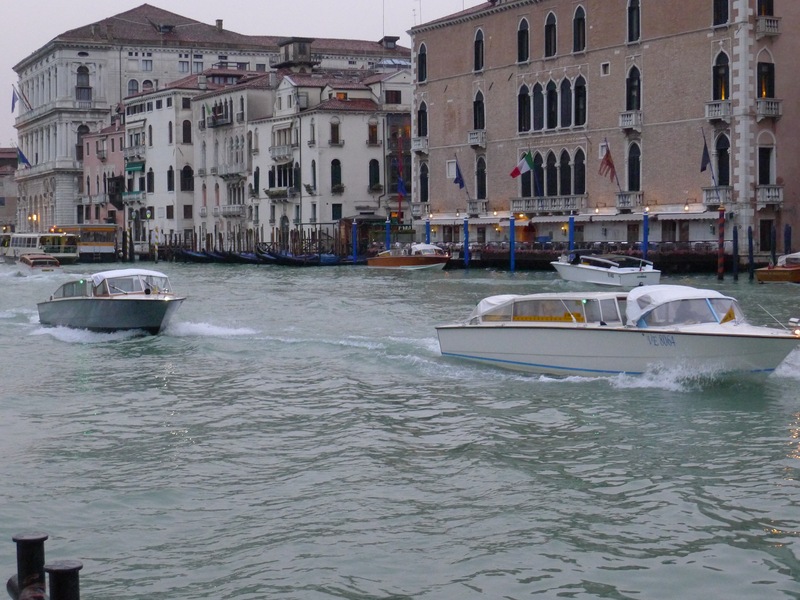 Personal vessels, public transportation “buses,” gondolas and delivery “vehicles” compete for space in the canal. 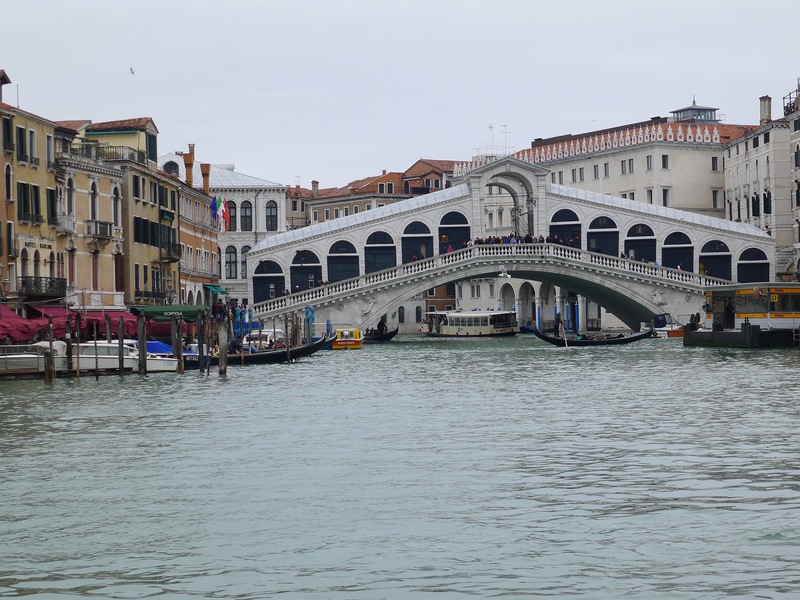 The Rialto Bridge is the oldest of the four bridges spanning the Grand Canal. The stone bridge, with the unusual design of two inclined ramps with a central portico, was completed in 1591. 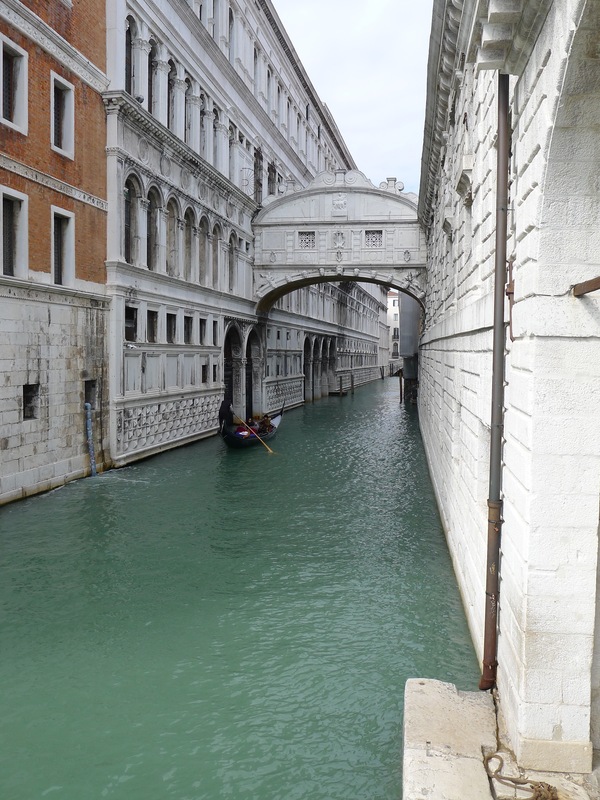 A similar bridge made of wood preceded the stone version. 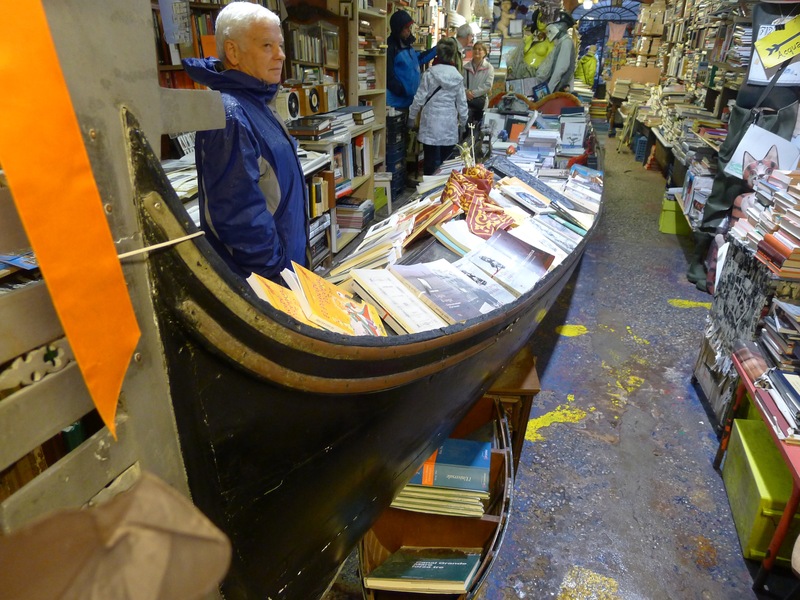 The centerpiece of this bookstore we stumbled on was a volume-filled gondola. At left is one of the members of our traveling group, Ray Brown. 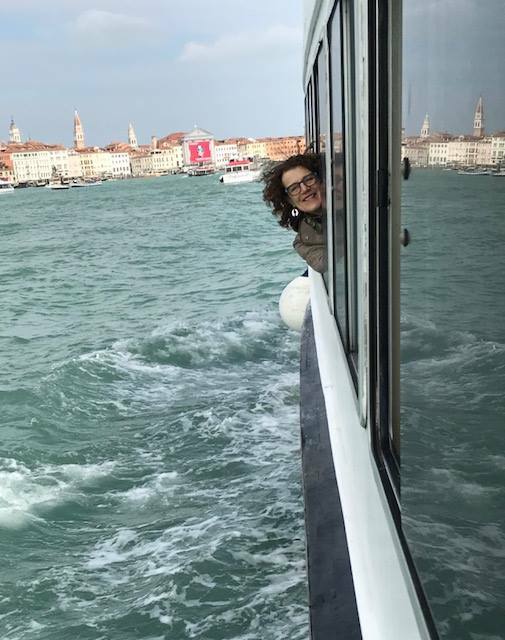 We leave Venice with this creative photo (compliments of Linda Brown) of Patty on a shuttle boat. Great story and pictures, Jim. We sure had a great time! 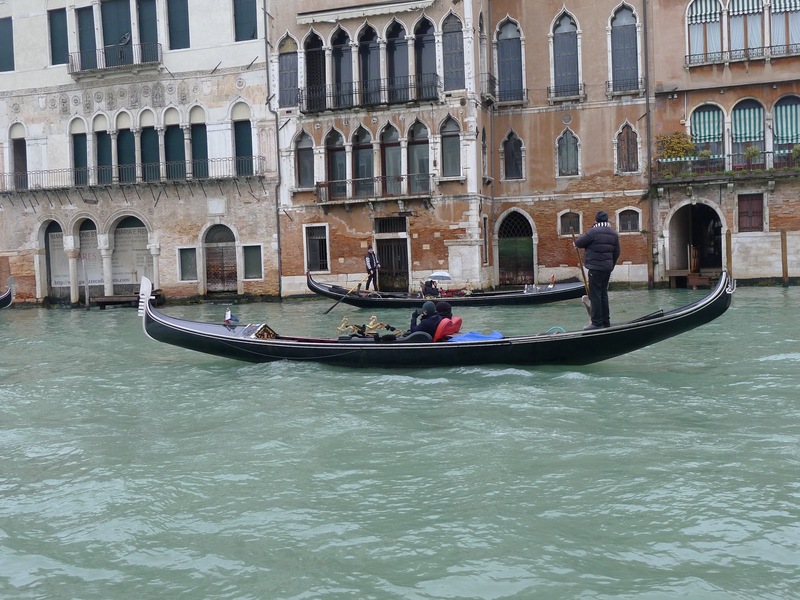 Thanks, Gloria…For you and Gerald, the European adventure continues! What a wonderful city. I hope to get there before I die. Thanks for the pictures. 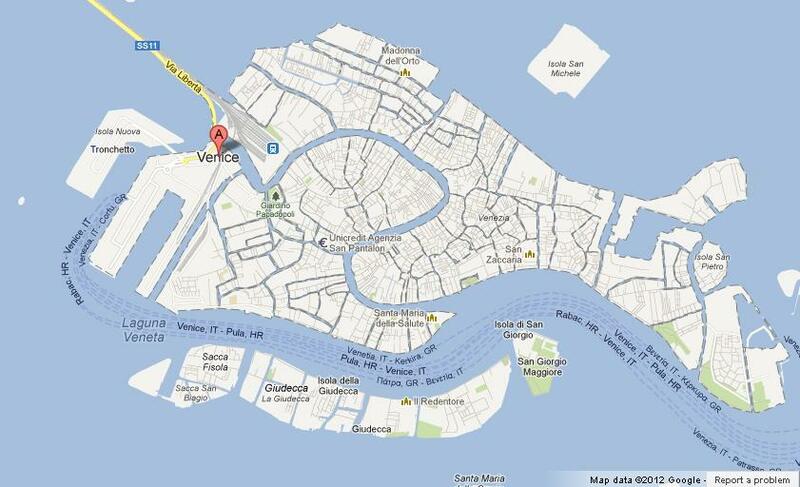 What an interesting description of Venice — have never heard that before. Can you imagine having Steves’ job (not Steve Jobs!!)? His books are very good. In addition to offering good guidance, he writes with in a conversational, sometimes personal, style that is very engaging. We always get the pocket versions, which are easy to carry around and don’t get in the way. Am only familiar with his work on PBS. He is very engaging. You get the feeling he could talk to anyone — an enviable trait. Great pics, btw. Love the side street at dusk. Great photos and commentary. Thanks for the tour! We missed your investigative reporting while you were gone, Glad you are all rested up now and ready to dig back into the trenches!